Around the middle of last year I started considering ways in which it might be possible to add a more aggressive, in your face element to Tau, which would better represent the Vior'la Tau Sept and their elite but hot-blooded fire warriors. Vior'la is a Tau Sept which orbits a binary star and is known for its extreme temperatures and difficult living conditions. The word Vior'la literally translates as 'hot blooded'. It is a notorious Fire Caste world containing a centuries old academy that is reputed as the most respected in the empire. The warriors produced here are especially aggressive and skilled in the art of death. The Sept warriors of Vior'la are usually painted with hot colours, like red and orange, and usually have many Fire Warriors and Battlesuits. Birthplace of Commander Farsight, it was the Vior'la that defeated the massive Ork invasion fleet in 600.M40. Vior'la annually passes through a gap between the two stars that make up its binary system, a time called the Trial by Fire. This causes deadly plasma storms to ravage the entire surface of the planet, whose inhabitants are only able to survive by closing protective domes around their cities. Following a masterful campaign of delay and holding measures, the Ork Warlord Garskark and his invading army were lured into this deadly storm and utterly destroyed by the raging plasma radiation. The Vior'la Tau list has now gone through 17 experimental variations and over 90 playtest games, finally being accepted for use at a number of local tournaments and campaigns. The challenge for the Vior'la Tau list is to make a fully-functional Tau army that is distinct enough from Tau 6.4 to be worth existing separately, but also neither to under-powered to appeal to new Tau players or too over-powered so that it invalidates any existing rules. Ideally the Vior'la Tau will be both a more aggressive incarnation of the army, and also a representation of the new Tau models released by GW in the 6th and 7th Edition of 40k. This means most of the list will be based on the exceptional work already done on the 3rd Phase Expansion army list, but includes units like the XV104 Riptide, Razorshark Strike Fighter and Sun Shark Bombers, as well as units that 40K players can only dream of using like the Manta and Orca that don't fit the 28mm game. Feedback, comments, criticism, complaints, requests and above all battle reports from playtests will be welcome at every stage. Last edited by Matt-Shadowlord on Fri Jul 05, 2013 9:47 am, edited 5 times in total. Sounds interesting, I have stickied the topic. Just post the army list here as an attachment when you want to. Sounds interesting, looking forward to reading it and trying it when I finished building my army. Looking forward to reading your ideas – a pal of mine has recently invested in an Epic Tau army, so it'd be great to be able to help playtest. Great, that would definitely be appreciated. The first draft will go up here after the new 40K Tau book has been released. It won't attempt to mimick it, since it has never been as simple as Epic being 40k at 6mm, but it should be informed by it. Now that the new Codex is out, I thought I'd post up a few thoughts. These are really just musings that might provide some inspiration, so please feel free to ignore/use them as you wish. I'm basing my suggestions on background more than the 40k rules, as I think that's the best way to help develop in Epic. The Tau doctrine of war places great importance upon dominating the airways above any battlefield they deploy to. It is their commonly held belief that controlling the skies is the first step in winning the engagement. By making the elimination of enemy flyers a priority, ground troops are allowed to concentrate on their targets without having to concern themselves with any threat from above. This strategy thereby enables the Tau to make full use of their mobile ground support assets. With no enemy flyers to worry about, the Sun Shark shoals are better able to line up their devastating bombing runs while Razorsharks fly circles around enemy infantry or armour, using the range and potent hitting power of their quad ion weapons to pick offf oes from beyond the range of most return fire. Cadre very adaptable and extremely lethal. The Sunsharks and Razorsharks are interesting potential additions to the Vior'la list, as v6.4 of the regular Tau list already has substantial air support. - I'd suggest that its AA is minimal – perhaps a single short-ranged 6+. This would tally with the burst cannon, (as on the Orca gunship) though a little tweaking would be needed to help it fit into the list as such. - It does have seeker missiles, so aircraft seeker missiles could be added. The main armament is a quad ion cannon, a new weapon. I think the unusual armament is sufficient to differentiate it from the other Tau aircraft (much like the Imperial Lightning/Thunderbolt), so this could either replace the Barracuda in this list, or be in addition to it. - The pulse bomb generator seems a cool opportunity to add some BP weaponry to the army. This flyer has a very different role and armament to any other Tau flyer, and I'd be keen to see it included somehow. The new codex has substantially increased the use of drones – perhaps this could be something to help differentiate the Vior'la list? - Sniper drone teams would make a cool garrison unit; working a little like Imperial Guard Sentinels. They have markerlights. - Grav inhibitor, pulse accelerator and shield drones could be combined into a 'defensive drones' upgrade, which would help in engagement/firefight range. - The Recon drone, heavy drone (FW) and interceptor drones are all larger. These could share basic stats if included. - The Recon drone would be a fun upgrade for pathfinders; perhaps allowing a reroll for teleporting Crisis teams within a certain range or similar? - Now multi-role; perhaps the AT version could be toned-down and made cheaper (thereby making Hammerhead railguns more attractive), and an AP option with lots of short-ranged ignore cover/disrupt missile attacks could be introduced. The Vespid Stingwings are of great use in warfare due to their speed, their ability to navigate over rough terrain and the lethal nature of their weapons. - I'd like to see these being introduced; perhaps with both the jump and jet rules. They'd make a good AP unit. Many of the the Tau units now have a new rule called 'Supporting Fire', which makes it harder to assault them – basically allowing units with the rule to shoot the enemy if they attempt to assault friendly units. I think this could be a very interesting rule in Epic, particularly as the game already has a supporting fire mechanic. - Perhaps units with the rule could receive +1 on their FF attacks (or similar) when engaged? This seems the best way to keep it 'within formations', which represent the 40k scale game. - More radicallly, it could allow nearby formations the countercharge move in order to get close enough to lend supporting fire. - A character upgrade for Tau Fire Warriors, perhaps adding an additional two pulse rifle shots, Commander, or both. This might be another option for introducing/improving the supporting fire rule above. So, those are my thoughts on the new stuff (aside from the Riptide, but that seems a fairly simple thing to convert over). Of course, these can't just be crammed in to the existing list, so something needs to give in order to let the Vior'la list breathe. I'd suggest replacing the Barracuda with the Razorshark. Changing the Broadsides so radically removes a lot of the punishing long-range stuff, so the Sunshark will fit in here. I'd remove the Kroot in order to introduce the Vespids and Sniper Drone teams. Pathfinders have lots more options, so I'd break them away from Fire Warrior formations and develop a dedicated Recon formation; perhaps conflating the Recon teams. By making these slightly slower but considerably more resilient, you'll give the Vior'la a very different feel. To make up for the loss of Pathfinders and encourage taking core Fire Warrior formations, the addition of defensive drone squadrons and the Cadre Fireblade upgrade will help. The new shorter-ranged Broadsides with more options should see more use here, too. An update is due soon, so watch this space. And thanks for the post Apologist, that was really good input. For Supporting Fire, I'd let units use their FF values in CC (though engaged units could still use their CC against the Tau units). Other things feel kind of disruptive - I feel like special abilities should be lower key. That, or such units could automatically pass Overwatch actions. Or be allowed Overwatch when they fail a command check (with or without losing blast markers). For Supporting Fire, I'd let units use their FF values in CC (though engaged units could still use their CC against the Tau units). What I am currently experimenting with is giving Crisis Suits and Firewarriors the controversial FF4+. That's something that has been requested enough that it would give the list a unique selling point to a lot of Tau players. The issue is balancing it properly, which means either it has to come at higher cost, or they have to give up something else in order to get it. I will be trying a version of this that requires the addition of an Ethereal to allow the boosted FF, similar to how an Ethereal boosts Firewarriors overwatch and close range shooting in the new 40K Book. Finalise changes to Broadsides, or sign off on current. Finalise changes to Manta Attack Dropship variant, or sign off on current. Finalise minor tweaks to Hammerheads, or sign off on current. Once this is complete, a version will go up on Tactical Command for criticism and comment. I'd prefer the Fireblade to be the upgrade granting FF4+ (as improving fire control is what they do in the background), while Ethereals had some from of morale mechanic (again, as that's what they do in the background). The newest version (0.4) will feature the Hammerhead being split into two choices at slightly different price points. The reason for this is to recognise the fact that Railgun version is sufficiently superior that a price point difference is required to make both worthy of consideration. The experimental change is to have HH formations that are not armed with Railguns drop to 175 for 4, while the Railgun armed ones remain at 200 for 4. Leman Russes kill more Hammerheads than vice versa at 75cm without ML, at 45cm without ML and at 45cm even with ML (although HHs would destroy slightly more points value). Hammerheads kill more Russes than vice versa at 75cm with ML. As a 5+ FF tank with 4+ armour, HH are less versatile than FF 4+, 4+ Reinforced armour Russes which are far more likely to win assaults. My conclusion was that if the extremely generalist and assault proficient Leman Russ is similar or occassionally better at destroying tanks than the very specialised and assault-poor Hammer Head, reducing the cost of HH armed with the less efficient weapons is the least I could do to make them viable. Cadre Fireblade added as an optional upgrade that allows Firewarriors to reach the coveted FF4+. 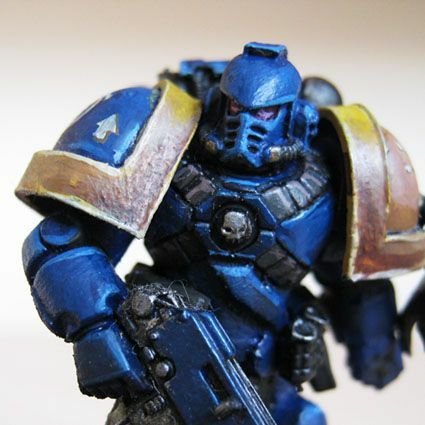 -- Note: Access to FF4+ in this army list is a key unique selling point, to allow players who want to use Tau and still find assault/firefight tactics viable. Riptide added as a formation of 3 Walker armoured vehicles. 'Railhead' Hammerhead Gunships added as a distinct variant from Hammerhead Gunships, with a different cost. This is in recognition of the fact that Railhead versions is so sufficiently superior that a price point difference is required to make both worthy of consideration. Devilfish are upgrade option for Pathfinders, rather than required. Recon Skimmer Group changed from 6 Tetra or Piranha for 175 to 5 Tetra or Piranha for 150pts. This is an extremely small cost increase per model (29 to 30pts) but easier to fit into lists and matches the amount of models per blister. 4+ armour and Tau Deflector Field. Price Point: Formation for similar cost to single Warhound. The Riptide has 4+ armour followed by a 5++ invulnerable Tau Deflector Field, and Thick Rear Armour. The slow firing rule on the Ion Accelerator is to represent the Nova-Charge version of the weapon in 40K (which fails to fire on a roll of 2 or less). I also intend to playtest a DC2 War Engine version of the Riptide that will be more expensive, using some suggestions from DaR. Note that the Riptide 40k model is in the grey area between being an over large walker and a small war engine, so since it could probably justifiably go either way balance in Epic games is the higher consideration. See image below for scale. Last edited by Matt-Shadowlord on Thu Jun 27, 2013 5:21 am, edited 1 time in total. As far as size alone goes, I'd say the Dreadknight is probably right on the edge of what could possibly be a DC2 WE, which makes the larger Riptide a pretty decent shoo-in. Also for comparison, the current Hive Fleet Leviathan is specing Trygons, Tyrranofex and Tervigons as DC2 WE, and those kits are more or less the same size, both in height/length and bulk. Likewise the new Eldar Wraithknight is basically scaled similarly to the existing (classic) Eldar Knight Titans, and those are DC2 war engines. It's taller than a Riptide, but in typical Eldar fashion, rather more spindly, so the overall bulk is about the same. For balance, I haven't personally played enough with the Tau list to offer a ton of insight there, so I'm operating very much on the 'like an <x> but more/less <y>' paradigm. To me, that's actually one bonus to going with a WE interpretation. It gives you something a little different than the rest of the list, rather than just another AV with a slightly different weapon config. The current suggestion is 275 points vs 250 for 4 Crisis suits. Seems roughly balanced to me, though favoring the cheaper Crisis. Beyond the clear advantage of firepower on the Crisis and mobility for Riptides, the determining factor is largely whether shooting at INF with 3+ is better or worse than shooting at AV with 4+. 3+ followed by 6+ is actually mathematically better than 4+ followed by 5+ (73% total saved vs 66% total saved), but glancing over a few of my army lists, AP weapons tend to be a lot more common on average, but it'll depend on the opponent. That said, if you have equal numbers of weapons, the better overall save plus extra model makes the Crisis a good bit more survivable. Personally, I like the mobility of Riptides, but I expect most people would probably opt for the Crisis, being cheaper, having extra durability and firepower and being Core instead of Support to unlock other goodies. Running the same comparison against 4 Hammerheads should let us equalize the INF/AV issue and the Core/Support issue. Conveniently, Hammerheads are also 4+ armor. To equalizing things further, we'll use the Twin Fusion variant, so both sides are packing MW4+ weapons. 3xFF4 vs 4xFF5 is very slightly in Riptide's favor. 3xCC5 vs 4xCC6 is in Riptide's favor, though the Hammerheads can force FF, which swings it back. The advantage of the Deflectors is roughly washed out by the extra model for the Hammerheads, with the Riptides being roughly 10% more durable on average. The 'heads have rather more overall shots, but slightly less projection on their AP and MW weapons, and require marker support for their AT shots, and don't enjoy the Jet Pack move which compounds that further. However, the HH are significantly cheaper than the Riptides. I'd be hard pressed to want Riptides at this profile over Hammerheads for what is basically a 40% premium. Jetpack moves are nice, but not that nice, especially since Skimmer pop-ups provide most of the same utility. I think that even if you don't go for the DC2 variant, you probably need to upgrade from TRA to Reinforced Armor at least, if you're going to keep the cost at 275. At that point the reroll for most saves would tip the survivability balance back towards the Riptides, which combined with their mobility gives them staying power that the Hammerheads or Crisis lack, to offset their lower total firepower. The other option would be to drop down to somewhere around 200 points for 3. At that point you're then choosing firepower or mobility against the Hammerheads, and cost versus firepower/core against the Crisis, which are both pretty interesting tradeoffs.